I know I said I wasn't going to be blogging this week, but the Pageant of the Transmundane has always been the exception to that. I mean, I sort of have to recognize the oddity that blogging brings to light... and I can't shrink from that responsibility. This week's winning entry comes from the relatively new blog Awesome Robot! What little nugget of strange and wondrous material did I find there? Well, conceptually, it all starts with Stalin Zombies, and it just gets weirder from there. When Gorbachev shows up, it is almost as if the whole thing reaches a transmundane critical mass. 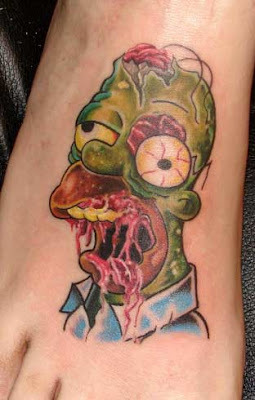 And since this has to do with zombies, once again I went to the well and found yet another picture of Homer Simpson as a Zombie... this time in tattoo form. Congrats go out to Sirio B, who also recently started a blog called Snack Overload! which seems quite interesting (even if I don't have access to most of the food that he discusses along with his partner). that was óne hell of a good reason to break the pause! It sounds a bit alike system of a down at times. I'm lovin' that Zombie Homer!